I thought I was bringing the world a much-needed service with this blog. And then I found THIS http://www.gothcruise.com/. These uber-Goths are actually living the nightmare! I could write for hours about how superb this is, and how we all, each and every Goth on the planet, should attend this irony-laden event, but my words pale into insignificance in the face of such awesome Gothness. I choose a quote from their marvellous FAQ, which sums up the very essence of my mission: "We find that the people who most enjoy the cruise are those in the scene who aren’t terrified by the ‘daystar’ and/or are comfortable using “Goth Block” (SPF 30,001) to keep from getting an embarrassing tan... This is vacation after all. You aren't expected to be uncomfortable 24/7." Genius on so many levels, not least of all the first recorded naming of the Sun as the "Daystar." I assume they'll be docking at Martha's Harbour. Saw the movie, very well done, and REALLY made me want to go!!! I always read about the cruise in Gothic Beauty magazine but have never seen video. Thanks for sharing! @Dracenea - The cruise mentioned in GB is *not* repeat *not* the same event as the Gothcruise; the woman running the "Gothic LARP Cruise" (or whatever she's calling it this year) has made some very questionable claims about running it for fifteen years, yet no photographs exist, nor does anyone on alt.gothic know anyone who's been on it prior to the last two years - a singularly curious state of affairs, as anyone familiar with Convergence or Whitby or WGT knows what kind of ridiculous shutterbugs we tend to be. The GothCruise you've linked up, now in its sixth year, is an unmitigated bucket of fun, as Ian says (hell, I met him on it a couple ships back). that was the best. how do i embed? Thanks for the info, Rafe! Fabulous. I actually joined gothnet or whatever it's called, just to get the cruise itinerary. 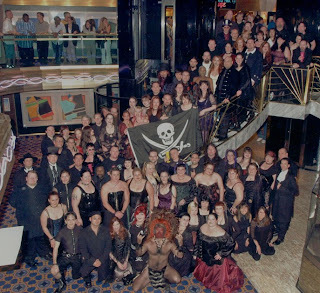 having been on the other goth cruise (www.gothiccruise.com), I have to say it was the best vacation I've ever taken. in all honesty, I really don't care whether it's been running for 2 years or 20,000, nor do I find that I'm overly concerned about which Goth cruise is actually the original one... what difference does it really make, after all? and in the end, the fact that there are two goth cruises is a Good Thing for those of us who want to go on 'em... having competition inspires businesses to improve their services and find ways to offer more value to their customers. WIN! I think we can all agree that however you choose to cruise, the real winner is Goth :) And Royal Caribbean obviously. Balcony Cabin anyone? Wasn't this a scene from the Rocky Horror Picture Show? It's the Acapulco Lounge on the Love Boat. I mean, the Goth Boat. Hah! I'm the non-goth in that picture with the glasses, just behind my goth wife (the brunette looking up the stairs rather than at the camera). It was actually a LOT of fun, was my first (and so far only) cruise, and the goths were all lots of fun. It was especially amusing when a group of about 30 of these people all crowded into the one outdoor hot tub that was in the shade. We dubbed it "Goth Soup". I believe I have a picture of that somewhere. What you CAN'T see well from this picture, but see a hint of, is that everyone else on the ship crowded around the balconies to see what the hell was going on. Too funny! Oh yeah, and Rocky Horror DID occur on this trip. As did karaoke, which was doubly fun when the goths mixed with the regular folks. After closer inspection, there are very few babes on this cruise, who the heck would a single Goth shag?!?! For cryin' out loud.